Have you completed your CA Studies and looking for a job. Whether its lately or more time, Chekrs brings you the solution to get Vacancies for CA updates that helps you to get the job updates that can be useful. In the era of startups the demand for the Charted Accountants has increased dramatically. If you want to see all of such opportunities than CA Vacancy in Banks, MNCs like CA Opening in TCS, CA Jobs in Genpact, etc might interest you. Apart from the functional area keeping in mind the dynamic change required in private sector you ar e given the job updates conveying job in…. If you think you have sound knowledge of auditing, preparing financial statements and accounts finalization then use the subscribe button to get access of all Latest Jobs for CA and Upcoming Govt Jobs for CA. 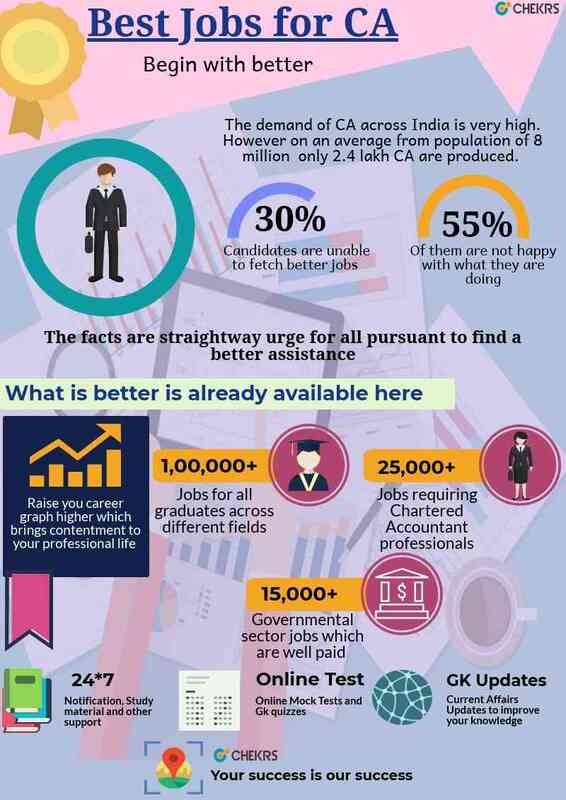 Why Chekrs for Latest CA Vacancy 2018? Almost every one in 10 person is opting for the profile of a CA, thus making it tough competition to get Chartered Accountant Jobs. If your selection is most important to you then Chekrs gives you the solution of required study material. You can take help from the papers, online mock test series and even the daily quizzes which are helpful in elevating your rank.